Creating compression and expansion technologies, from idea to the customer. The Centre for Compressor Technology offers world leading research and development of twin screw machines and compression and expansion technologies. The Centre is the hub for scientists, engineers and industrial experts to work together to solve some of the biggest challenges facing the compressor industry in energy utilisation. serving as an aid to industry in the design, manufacture and operation of such machines, both in existing and novel forms. Funded mainly by industrial contracts, but with some input from public funding, members of the centre have developed software for improved analytical modelling of both compression and expansion processes, the use of computational fluid dynamics for more detailed studies, including solid-fluid interaction and noise reduction and test facilities for both air and refrigerant compressors and detailed internal flow measurements. By this means, apart from its ongoing research activities, the centre is able to investigate and solve industrial problems, offer courses in machine design both to registered students and industrial engineers, license proprietary software and, if required, carry out the complete design, build and testing of prototype machines for industry. 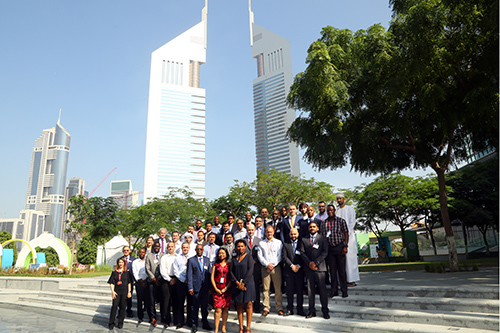 Additionally, the centre organises and hosts a biennial International Conference on Compressors and their Systems, which is sponsored by the Institution of Mechanical Engineers (IMechE), the Institute of Refrigeration (IOR) and leading industrial manufacturers. This has been functioning since 1999 and is a leading forum for academic, research and industrial organisations concerned with the development of fluid machinery. 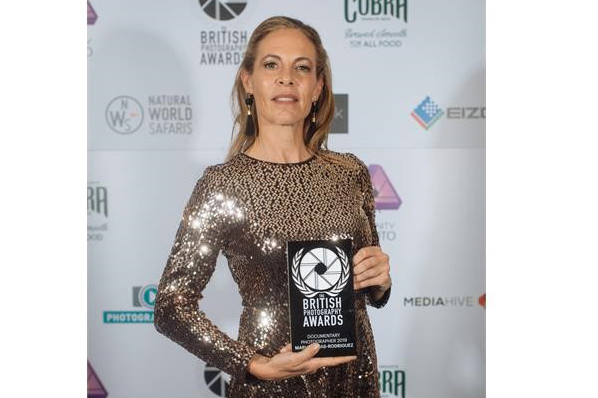 Centre members have been granted 12 patents, published three monographs, 85 journal papers, 166 conference publications and over 200 industrial reports, for which they have received 13 professional awards and prizes. 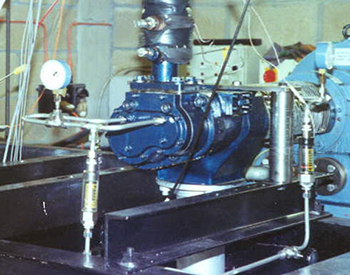 Following three years of collaborative work between Professor Ian Smith, who was attempting to develop screw expanders, for recovery of power from low grade heat, at City, University of London, and Professor Nikola Stosic of the University of Sarajevo, who had significant experience in the development of similar machines as compressors, the centre was established in 1995, when Nikola Stosic was awarded a Royal Academy Professorship, with industrial co-sponsorship by Holroyd, of Milnrow, Lancs. 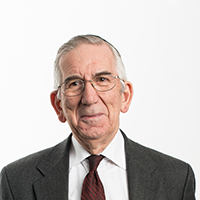 Professor Ahmed Kovacevic, who had been working on screw compressors since 1986, joined them in 1996 and pioneered the application of Computational Fluid Dynamics to evaluate the screw machine performance. 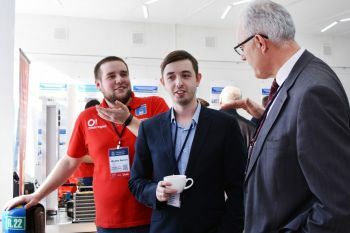 Latterly, they were joined by Dr Elvedin Mujic, who made a significant contribution to noise reduction and who now holds a senior position in industry, and subsequently by Dr Ashvin Dhunput, who also now holds a senior industrial position. 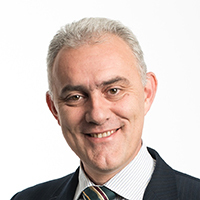 More recently, they have been joined by Dr Matthew Read. 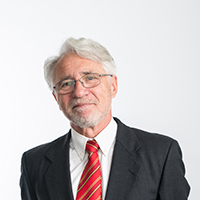 Dr Read is now a lecturer in the School of Mathematics, Computer Science and Engineering. He makes a significant contribution to integrating expanders into power recovery. Patents for the “N” rotor profile in 1996 and 2013. The “N” rotor profile is now the industry standard and has generated significant income for City. Trilateral Flash Cycle and Wet Steam Cycle for improving the efficiency and reducing the cost of power recovery from low grade heat sources. Four fully equipped laboratory test rigs for compressors and expanders, built to meet highest industrial standards. Holding a Royal Academy Chair in Positive Displacement Technology between 1995 and 2000. Introduction of the Howden Chair in Engineering Design and Compressor Technology in 2008. Supporting Electratherm, Reno, Nevada, USA since 2005 in their development and marketing of screw driven Organic Rankine Cycle (ORC) systems for waste heat utilisation. Establishing Heliex Power Limited in 2009, as a spin out company from City, University of London for use of steam driven screw expanders for waste heat utilisation. Establishing postgraduate courses in Mechanical Engineering at City, University of London, providing a Master of Science education to more than 300 young engineers in screw machine technology through the unique theory and laboratory courses. PhD students have been supervised by centre members, leading to their successful doctoral grades in area of Thermodynamics, Fluid Mechanics, Computational Fluid Dynamics, Metrology and Tribology in positive displacement technology. Recently the centre has been joined by a group with extensive expertise in materials, focusing on numerical and experimental research in composite materials and manufacturing processes. Avoiding seizure in the event of rotor direct contact. 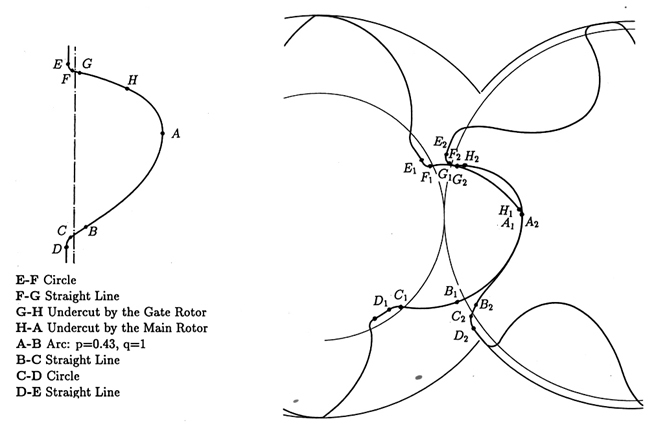 "N" rotor profile diagram. View full-size image. Two-phase process lubricated screw expander on test rig. View full-size image. Expanders have a variety of applications but for positive displacement machines, their biggest potential is for two-phase processes where they may be used to replace throttle valves and for large scale power recovery from low grade heat sources. The centre holds vital patents on the use of any type of positive displacement machine for this purpose and has developed low cost, process lubricated twin-screw expanders with adiabatic efficiencies greater than 75%; the highest value ever attained in a two-phase expansion process. Given the required performance data, the centre offers full design services either for a complete compressor or expander, or for rotor and porting only, given the details of the machine. The output is then delivered to the customer in the form of drawings, which are also accessible electronically from a secure site. The centre is also able to arrange prototype manufacture and has test facilities complying with full international standards for the testing of air and refrigeration compressors. 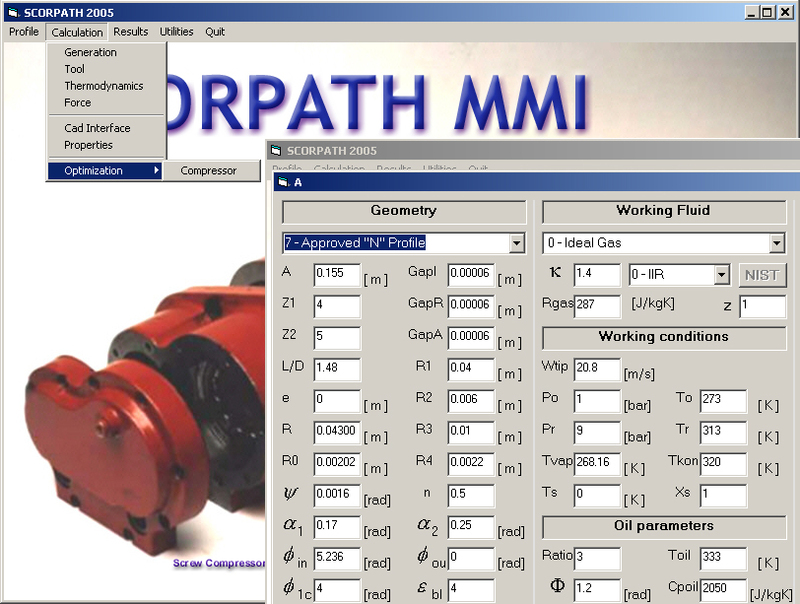 The centre has developed an extensive range of software to aid the design of compressors, which is continually being upgraded. The main package is known as SCORPATH (Screw Compressor Optimum Rotor Profile and THermodynamics). Starting from the specified compressor duty and the minimum number of assumptions, this program determines the optimum machine geometry and rotor profile to obtain the desired results. The output includes full details of the rotors and their porting which can be imported directly into a CAD system, together with performance predictions, bearing loads and suggested choice and details of the tool profile required to manufacture the rotors. User licences are available for this package. 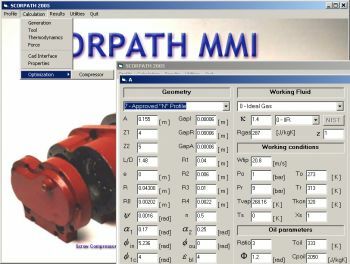 Screenshot from the SCORPATH software. View full-size image. Computational Fluid Dynamics (CFD) is widely used today as an aid for optimising the design of fluid machinery. However, due to the complexity of the geometry and other associated problems, this analytical tool was not used for screw compressors. 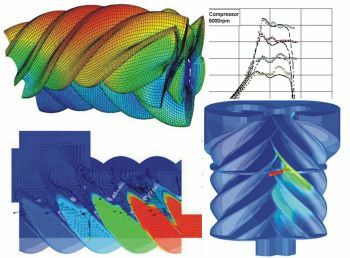 The centre has developed SCORG (Screw Compressor Rotor Geometry), a grid generator, together with associated supporting functions, which enables screw compressor flow and performance to be estimated when attached to commercial CFD and CCM (Computational Continuum Mechanics) solvers. In the latter case, solid-fluid interactions can be estimated so that component distortion and its effect on compressor or expander performance can be estimated. As in the case of SCORPATH, user licences are available for this software package. Screenshot from the SCORG software. View full-size image. We invite high-calibre students with a passion for research to join us and study for a PhD. Potential PhD topics are outlined below. If you are interested in one of these, please contact the named supervisor or Dr Yan Youyou, Senior Tutor for Research in SMCSE. Note that there is no funding attached to these topics: applicants must make separate arrangements to fund their studies. Full details of the application process are available online. On your application form, please state that you wish to be considered for admission to the Centre for Compressor Technology, Department of Mechanical and Aeronautical Engineering. 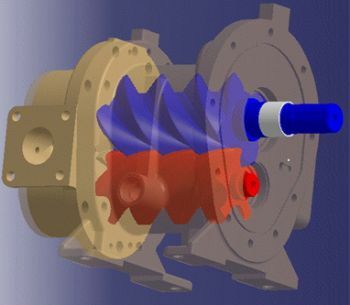 Leakage flows play critical role on the performance of rotary positive displacement compressors. Such compressors today are used in refrigeration, air-conditioning, oil and gas, process industries and air compression and consume more than 20% of electrical energy generated in industrialised countries. Even small reduction in leakage flows will make significant savings and reduction of carbon footprint. To develop the high efficient screw compressor, the leakage characteristic needs to be acquired. However, the leakage characteristic is very difficult to obtain due to the complexity of geometry and process. This PhD study will contribute to better understanding of the leakage characteristics of screw compressor by means of numerical and experimental methods. It will utilise existing compressor test rig and the numerical methods previously developed in the Centre. Unsteady Thermo-Fluid-Solid Interaction is a common fundamental physical phenomenon in leakage flows among various rotary machines. The effect of unsteadiness and conjugation have not been extensively studied previous and potentially this could lead to inaccurate or misleading engineering design strategies. In the open literature, there is a lack of consensus in fundamental understanding of the unsteady CHT analysis methods. Multi-physics modelling tools are currently available, but still in development stage. The remaining challenges being faced include the disparity in the time scales, computational efficiency, reliability of turbulence models, etc. In most cases, there are little experimental data to validate the accuracy of modelling methodology. This research will provide a series of benchmark experimental data using LDV and PIV techniques in optical Roots blower. These data will be used to understand the fundamental physics of heat transfer in leakage flows and support further development of the multi-physics modelling and multi-disciplinary design strategy for improved energy efficiency. Single and multiphase screw pumps usually have very large helix angles which makes it very difficult to use Computational fluid dynamics for estimation of their performance. The numerical procedures explained in literature are based on generation of the numerical mesh in a cross sectional area which follows the rotor helix and gives a good conformal mesh. 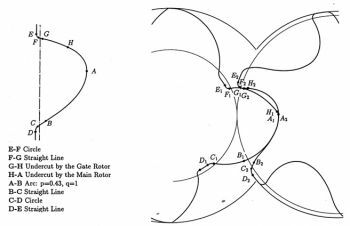 However, if the rotor helix is large, the cell skewness becomes prohibitively large which introduces error in numerical simulation. This research is focused on method to develop numerical grid generation for screw machines with large helix angles to enable reliable and fast solution using generic CFD solvers. The developed methods should be validated by experimental results. The project will allow development of methodologies for evaluation of system dynamic performance, and the system nonlinear fluid-structure coupling. Despite grid generation for twin screw machines has reached maturity, analysis of screw machines with non-parallel axes such as single screw or for internally geared screw machines, still poses great obstacle for numerical analysis of such machines. This research will be focused on methods for numerical grid generation of screw machines with non-parallel axes and internal gearing. The developed methods should be validated by experimental results. 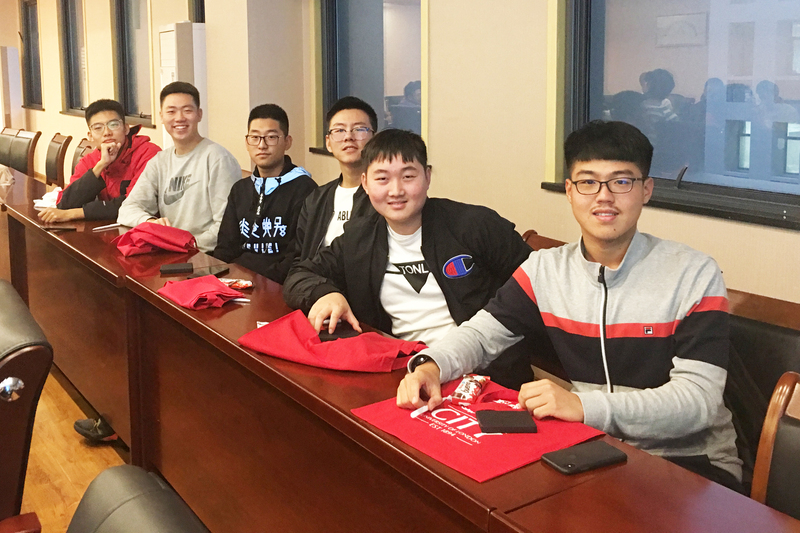 The project will allow development of methodologies for evaluation of system dynamic performance, and the system nonlinear fluid-structure coupling. Twin screw machines are today widely used as compressors, expanders, pumps or motors in different industrial applications which either require or permit coexistence of gas and liquid in the system. These are known to be very reliable for handling clean fluids with relatively small content of liquid. To improve designs of such machine for multiphase flows of solids, fluids and gases it is necessary to fully understand flows in the inlet and internal passages. This research study will focus on experimental investigation of the suction and internal flows of such compressors by use of Laser Doppler Velocimetry in order to fully understand suction and internal multiphase flows. 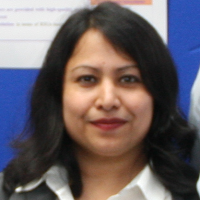 The study will help to develop experimental methods suitable for such investigation and will provide computational suite which will allow automated integration of measured results with the results of performance prediction obtained by numerical means which will further allow optimisation of machines for multiphase fluid handling. Recent estimates suggest that the amount of heat rejected in industrial processes is greater than all renewable resources combined. The use of organic fluids in Rankine cycles has potential advantages for maximising the power generated in waste heat recovery applications. The cost of these systems is however high due to the low conversion efficiencies possible from such sources (typically only 10% or less). Recently, interest in power recovery from such heat sources has increased, particularly for smaller units where the number of potential heat sources is greatest. The use of Rankine Cycles with organic working fluids (hydrocarbons or refrigerants) instead of steam is well established for low temperature power generation, and the expansion of liquid or 2-phase fluid (rather that superheated vapour) has been shown to improve performance. Depending on the application, waste heat recovery can be achieved using single cycles, or as cascaded systems where the heat from the source is used to heat fluid in a high temperature cycle, the condenser of which provides a heat input to a low temperature cycle which uses a different fluid. This project will investigate the effect that the choice of single or cascaded cycles has on the performance and the specification of components in the system for particular applications. A range of expander, pump and heat exchanger technologies will be considered in order to identify suitable system configurations to enable greater uptake of this technology. 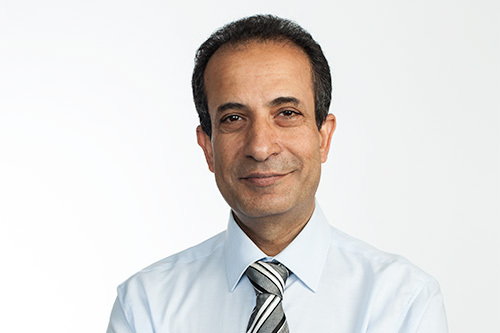 The Semiconductor Industry Association roadmap proposes that growing one dimensional (1D) metal oxide nanostructures in specific sites greatly helps the in-situ fabrication of electronic circuits, semiconducting nanostructures for gas sensing applications. Existing techniques have had limited success. We propose developing a new state of art novel oxidation system for growing site-specific 1D metal oxides on metal substrates. It will consist of design and commissioning of a state-of-the-art facility with controlled gas system to investigate the effects of different and material parameters and characterisation of as grown nanostructures through the newly developed instrument. This project propose to illuminate different metal substrates to create localized hotspots in a closed environment containing an oxygen species for oxidation, to promote 1D growth. The as-grown nanostructures will be characterized at different stages by TEM, FESEM, EDS, XRD, XPS, EBSD etc to sought out the growth mechanism and epitaxial relation of 1D nanostructures with the substrate. Development of lead free bonding materials for interconnects and die attachment for semiconductor devices operating at high temperatures and under harsh and demanding conditions is a priority for the semiconductor industry. Transient liquid phase (TLP) bonding is an effective way to form high melting materials from a combination of components, one of which has a low melting point. It can form intermetallic joints with the melting temperature much higher than the bonding temperature. Understanding microstructure and defect formation is vital to the successful use of TLP bonded materials in semiconductor devices. Control of microstructure, grain shape and size, crystallographic orientation and asymmetric diffusion of main components of TPB systems are expected to lead to the formation of better quality high temperature interconnects and die attach. This project proposes to model the residual stress in selective laser sintering of some common metallic particles. Additive manufacturing is the latest technology for the many engineering parts production. There are many parameters that can influence the residual stress for the parts. This project will investigate those process parameters to optimise the best possible solution to get compressive residual stress instead of tensile residual stress. with variable frequency motor of 75kW, maximum air flow of 15 m3/min and maximum pressure up to 14 bar. The test rig meets CAGI and PNEUROP test standards where the testing procedures are carried out according to ISO 1706. The rig is certified by Lloyd’s register. for screw compressors up to 4 bar discharge pressure and discharge temperatures up to 225 deg C. The test rig allows classic performance testing and LDV testing of flows in the suction of oil free compressors. This is used for study of leakage flows in narrow gaps in rotating machinery using LDV, PIV and high speed camera. Investigation of mechanically faulty parts. Corrosion testing in various environments (Mild to Harsh). PARSTAT MC Potentiostat - Electrochemical corrosion testing, Potentio-dynamic and Potentio-static corrosion testing and Electrochemical coatings. ATLAS Automatic hydraulic press (40 Ton) - Composite pillets, Metal pillets production with diameters of 13mm, 20mm, 32mm and 40mm. 10 Tonnes hydraulic bench press - Pillets removal from dies and mechanical testing. Hot plate Magnetic stirrer - Powder processing for the production of composites and various metal structures with temperature of 0-550°C and stirring speed of 0-1500 rpm. Sonicator - Production of nanoparticles. Vickers hardness tester - Hardness testing with loading capacity of 3kg-187.5 kg. Instron Tensile testing - Tensile, compression and shear testing with maximum load of 50 KN. Rolling machine - Rolling metal pieces. Grinding machine - Grinding samples for metallographic analysis, SiC grinding paper, Grit order of 240,320,400 and 600. Polishing machine - Polishing samples for metallographic examination with Diamond polishing paper of 1µm and 6µm. Keyence microscope - Metallographic analysis with lenses of 20-200µm and 500-5000µm with adaptor to convert co-axial to wringlet light. Square ovens - Annealing of samples. Two ovens at temperature of 400°C and 500°C, heating rate of 5°C/min. Carbolite horizontal tube furnace - Sintering of samples in inert gas setup (Argon/Nitrogen). Heating length of 45mm, maximum temperature of 1200°C and heating rate of 5°C/min.